During this year’s Cloudfest, the complimentary celebration of finance best practices for the subscription economy made its mark in New York City. Hosted in Manhattan at The Smith Midtown on March 14th, 2019, it was an evening of collaboration, cocktails, and hors d’oeuvres. It was bright and early, when the team rose to travel to NYC for Cloudfest. Mike Mooney and I first convened at Carlson Management Consulting’s headquarters in Woburn, Massachusetts. We then embarked upon our road trip to NYC in my Highlander, which was filled with banners, collateral, monitors, a projector, screen, and more. The team made the journey to NYC through diverse means of transportation. Josh Ladd, Rory O’Donnell, Guy Desrosiers, Peter MacIntyre, and Adam Westbrook (via London) made the trip by the Accela train. Ethan Carlson arrived by plane from Burlington, Vermont. Joe Giorgio drove from New Jersey. When we all arrived at The Smith Midtown, we immediately prepared the room for the event. Everyone pitched in to setup our displays, presentation materials, demo stations, and more, ensuring the smooth start of Cloudfest NYC. Cloudfest NYC then opened its doors, with attendees beginning to arrive at 4pm. During the first 45 minutes, everyone networked with their peers in finance while enjoying hors d'oeuvres and specialty cocktails. The private dining room filled with the sound of lively conversation as people mingled to make connections. Mike Mooney, Manager of Sales and Business Development, initiated the thought leadership sessions with a warm welcome message and overview of Carlson and its clients in the subscription economy. Attendees learned about the subscription businesses experiencing greater success thanks to Carlson’s services and cloud financial technology solutions. Josh Ladd, Director of Adaptive Insights Implementations, explored new frontiers in finance with his illuminating presentation on Integrated Revenue Planning for Subscription Firms. Specifically, he shared how subscription businesses can use cloud financial technology to integrate their financial planning for deeper insights on new deals, existing deals, churn and upsell, commissions, hosting fees, hardware costs, headcount, and more key metrics. Attendees also discovered how Adaptive Insights gives them a big picture of business performance by helping them analyze operational and financial data together. "Cloudfest was an opportunity to meet new folks and demonstrate the power of Adaptive Insights through my Integrated Revenue Planning discussion. The venue provided an intimate setting to engage our fellow peers in finance to be part of the discussion. It was a great experience that allowed me to present on a topic that is top of mind for a lot of FP&A professionals. I really enjoy sharing the best practices that I’ve accumulated having worked with so many SaaS, media and other firms that have implemented subscription-based revenue models." Peter MacIntyre, Director of DataBlend, further explored the integrated revenue process with his presentation on how subscription businesses can leverage DataBlend to integrate their core financial and operational systems. As MacIntyre demonstrated DataBlend’s capabilities with a demo of how to pull in data from Salesforce into Adaptive Insights, attendees were able to see first-hand how the solution unifies data across systems, leading to real-time information, better business decisions, and improved financial performance. "Cloudfest was great because it gave finance professionals who leverage cloud financial technologies an experience to network and share their stories. It’s always interesting to hear how other people and companies are using business planning and financial management software to their benefit, which was especially heard through the presenters and the panel. There are a lot of systems out there, with multiple ways they can be configured, so it’s exciting to hear the different methods being used and how they can all integrate with iPaaS solutions like DataBlend." The two sessions sparked ideas and curiosity, as attendees considered how they can best implement the integrated revenue planning process at their own subscription businesses. As attendees asked thoughtful questions, Ladd and MacIntyre provided customized answers about how they can unify data to take their subscription businesses to new heights of achievement. Sage Intacct, the only Platinum Salesforce partner that provides complete quote-to-financial forecasts, was the next focus of the evening. David Appel, Head of the Software and SaaS vertical at Sage Intacct, gave an educational presentation on how to build a model that brings more flexibility and accuracy to subscription billing. Attendees learned how to save time and drive greater revenue with a model that fits the needs of their businesses. Attendees then enjoyed hearing success stories from savvy finance professionals who are effectively leveraging the powerful benefits of business planning platforms for their businesses. The all-star customer panel was moderated by Ethan Carlson, Founder and CEO at Carlson. 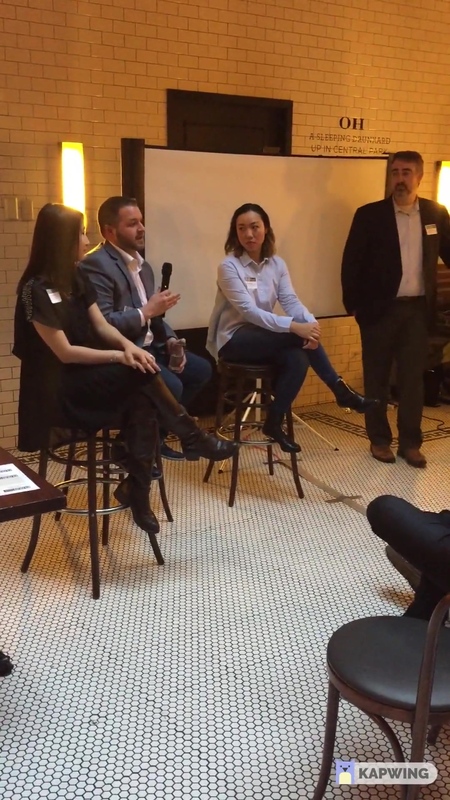 The panelists featured Ginji Wang, Vice President of Finance at Fi; Katrina Law, Accounting Manager at Stack Overflow; and Patrick Hughes, Director of Corporate Financial Reporting & Operations at Intralinks. These panelists shared how their great experiences with either Adaptive Insights or Sage Intacct, along with the services and support of Carlson’s consultants, help them elevate their revenue planning and financial performance. After the speaking sessions, attendees continued networking as they conversed about their personal takeaways from the experience. Every year, Cloudfest impresses attendees with exploration. It’s an event for learning best practices and world-class financial technology solutions. Cloudfest NYC was an evening to remember in many ways. It brought finance leaders together for collaboration. It was a sharing of knowledge. It was also a time of discovery, as minds meet innovation. Attendees discovered newfound ideas and perspectives that will help them bring finance transformation to their subscription businesses. Interested in learning how finance best practices can be implemented in your subscription firm? Contact us today for a discovery call.